If you have the option to decline Search.hcrimereport.co, you should do it without thinking about it twice. You also should think carefully about the installer promoting this browser hijacker. Even if the hijacker is bundled together with much more attractive programs, you want to think if they are reliable and legitimate. Most likely, you downloaded “Crime Report” along with the suspicious search tool. This Internet Explorer, Mozilla Firefox, and Google Chrome compatible extension promises to provide users with crime reports. Although the service offered by this suspicious program is not something that would be universally popular, there is no doubt that someone could be intrigued by it. The official download sources are crimereport.co and chrome.google.com/webstore/detail/aooohokoiadepgpbdoflaoabbhbkpmlo, but the suspicious extension could also be spread by third-party installers. Before we move on and you learn how to delete Search.hcrimereport.co, we suggest scanning your operating system to check if more serious threats exist. If they do, you must remove them first. Eightpoint Technologies Ltd SEZC (affiliate of Polarity Technologies Ltd.) is the creator of the suspicious Search.hcrimereport.co and Crime Report. It is also the creator of QuickMapsAndDirections and many other reported hijackers and unreliable extensions. In most cases, every hijacker has a unique extension representing it. While the hijacker might not be appealing, it might be much easier to sell an extension that, allegedly, can offer beneficial services. In reality, Crime Report IS Search.hcrimereport.co. Once the extension is installed, the New Tab page is modified to represent the hijacker. At the top of its interface, you can find links to Crime Reports (crimereports.com), Check People (checkpeople.com), and Truth Finder (truthfinder.com) pages, which might make you think that the tool works. Well, considering that you can easily bookmark these pages, the extension is truly useless. It is not like it can provide you with access to exclusive content or anything like that. The truth is, it is unlikely that the hijacker was created to promote links to crime-related websites. Instead, it was created to expose users to an unreliable search service. Search.hcrimereport.co redirects searches to search.yahoo.com. You can find two different search fields on the interface of this hijacker. One is represented in the form of a search box, and it is located at the top, on the left of the easy-access links we discussed already. The other one takes the center stage, as it is displayed in the middle, along with a few easy-access links to third-party websites below it. If you enter any keyword into the search field, you will be redirected to Yahoo Search. 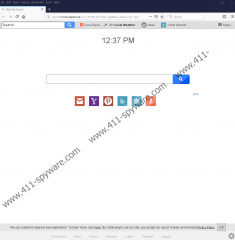 If you use this search tool on a daily basis, you might not think anything of it; however, the hijacker can modify the results, and that puts you at risk every time you decide to browse the web. Hopefully, you have not interacted with the search tool yet, and you can still remove the unreliable extension without facing any real threats. Of course, if you have put yourself at risk already, you need to think carefully about what you might have been exposed to. Maybe you interacted with unreliable surveys? Maybe you downloaded something suspicious? We encourage you to remove Search.hcrimereport.co from your browser immediately, and you can do that by deleting Crime Report. Instructions that show how to get rid of this suspicious program are available below. While we are sure that you will have no trouble erasing the extension and hijacker manually, we cannot be sure whether or not you will be able to clean your entire operating system yourself because we do not know what other threats might exist. If you do not know this either, install a malware scanner that will help you figure it out. When it comes to removal, you should find the guides you need on our website, but it might be best to install an anti-malware program that will take care of existing threats’ removal, as well as the security of your entire operating system. Click the Start/Windows logo on the Taskbar. Launch the browser and tap Ctrl+Shift+Delete. Tap Ctrl+Shift+Delete and select a time range. Mark boxes and click Clear Now. Mark boxes and click Clear data.